Today is my 8th wedding anniversary with the husband. YAY! We’ve known each other for 15 years and have been together for 11 but it’s so crazy to think that we’ve been married for 8 years. I love this day and despite the fact that I had a huge 250 guest wedding back in 2003 and then a very fun Vegas wedding renewal in 2006, I always think about what my wedding dress would look like today if I got married again. And with the rate I’m going with weddings it’s totally possible that I could have another wedding (to the same guy) in the future. 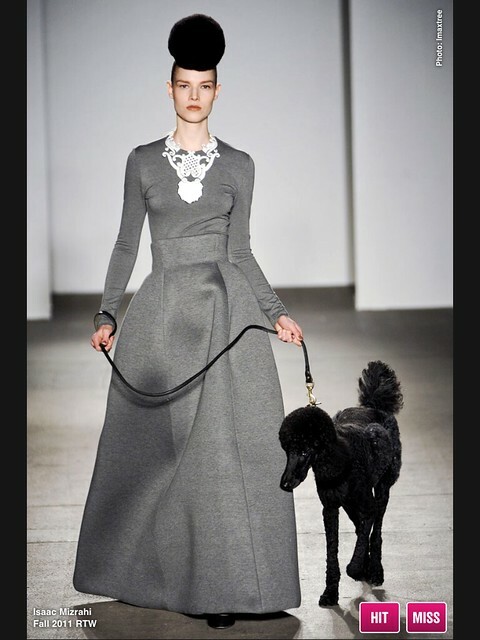 I love this Isaac Mizrahi dress that he showed for his fall 2011 ready to wear collection. I saw it and immediately loved the fullness, the simplicity and even how he paired it with such a big statement necklace. When I got married in 2003 I was 24 years old and I listened to everyone’s opinion on what I should wear. Don’t do lace, don’t have sleeves, you should have a train…and I ended up wearing a dress that wasn’t my first choice but it wasn’t the end of the world either. Clearly, my fashion sense and confidence weren’t’ fully developed yet. When we did our Vegas wedding I went for a beautiful off white dress with silver embroidery that was a classic shape but in a fun textile, way more me. So if I got married again today, I think I’d want a modified version of the Issac Mizrahi dress. Something very similar but with short sleeves and a slightly lower neckline. 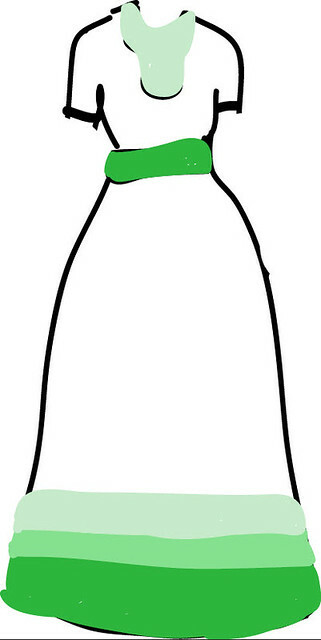 I’d want the dress to be white but ombre on the bottom with Kelly green (my favorite shade of green) as the darkest color on the bottom of the dress and a band of Kelly green around the waist. Of course I’d have to accessorize it and add a massive statement necklace and killer green shoes. If only I knew then what I know now, I think my wedding dress might actually be killer and totally represent me. So am I crazy for dreaming about a wedding dress despite celebrating 8 years of marriage? Any brides out there? What are you dreaming about wearing on your big day? happy anniversary lady! and what a cool dress. very late 19th century London. Happy Anniversary! and yes I could see you in that dress with some awesome statement necklace. And. Swoon. I’ve fallen in love with that dress. How much would it set me back? I have no clue how much that dress would cost. I don’t want to know…it would kill the dream. I fell in love with this particular Isaac Mizrahi collection. I watched the presentation more than once. I adored the poodles and artistic cakes. Happy Anniversary! Megan, I looooved that collection too. I’ve actually loved the last few of his collections, he’s so magical and whimsical.